Speaker brackets for satellite speakers. Full motion adjustable. Material : Plastic. Max load: 7.7lbs (3.5kgs). Mounting hardware included. Wall Mounting and Ceiling Mounting; Adjustable. Material: Steel. Load Capacity: 22LBS. Mounting hardware included. Wall Mounting and Ceiling Mounting; Adjustable. Material: Plastic. Load Capacity: 10LBS. Mounting hardware included. Speaker stands with mounting hardware is available at SFCable, now deliverable at your doorsteps. The speaker stands are created for various uses, you can choose one according to your requirements. 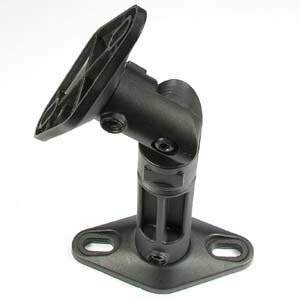 We have a range of satellite speaker mounting bracket, and speaker mounts available in various designs. Go through our range in this category and order one aligning with your needs. We, at SFCable continuously strive to achieve customer satisfaction and thereby offer quality products at very competitive prices. We also offer quality after sales service and lifetime technical support on all our products.